Polyester ID Bands are available as "shielded" bands for use with paper labels and "non-shielded" bands for use with polyester labels. 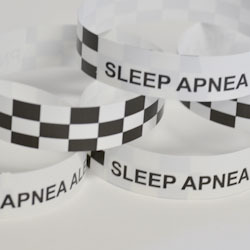 They are also available as patient alert bands in standardized colors. If you don't see a product you need, call us and we will get it for you. Call or email for contracting price. check out our Polyester ID Wrist band page.